Suggestion: Increase the number of entries in the RSS feed from 5 to... 25, maybe? Is it cos I is ginger? Chatroom, its not syntaxbomb without a chatroom! Perhaps a small bug in the Code Archives: the line numbers get copied along into blitz when trying to copy-paste the source codes, which blitz doesn't like. Huh, that's just silly - I'll see if I slap in a link to just highlight the code. Yes, copy paste works ok without the line numbers. Try selecting only inside the code box. Does this mean I don't to dive in and alter the forum code? yep, seems to work fine as long as you select it like this..
Hmm, of course I'm not using Ctrl+a(duh). Just the regular Ctrl+C or V. Also tried RightClick>Copy/Paste: same results. Proof? It happens when selecting the entire text or only piece of text as well. I've also checked out the possibility that was a browser specific thingy, but tried both IE11 and Chrome and makes no difference. I'm on Windows 10 Pro Creators Update and haven't run into this anywhere else yet. Could be an odd setting on my system, but I find it hard to imagine what could cause this.. I'm not looking forward to be taking out the line number every time, especially on the larger pieces of code. Perhaps a download button like the original Blitz site isn't such a bad idea, for one thing its more easy(if possible)? I agree, a Download Source link is needed. In the mean time, you can go to the official Blitz archive at http://wasted.nz and download from there. I don't get any line numbers even if I select the whole page, I'm using Win 7 Home Premium + Firefox 54 32-bit. 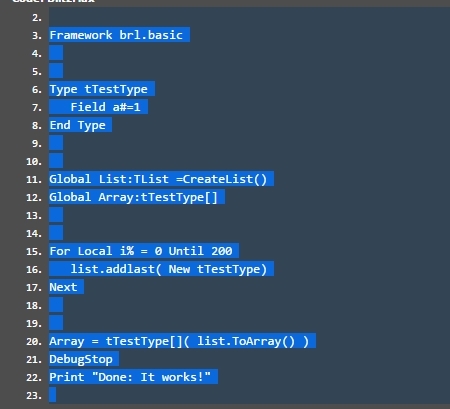 I would like to ask Qube if he could increased the default code font size by one or even two sizes, as it's smaller than the custom syntax highlighted ones.